Sharing actionable knowledge helps to turn ideas into reality. The Technical Centre for Agricultural and Rural Cooperation (CTA) has seen powerful returns from bringing together young entrepreneurial thinkers and doers from all over Africa, the Caribbean and the Pacific. Kobusingye’s flagship product, the fish sausage, has been developed from a small investment in an overflow supply of locally-sourced tilapia. Her creative food product had never been seen before “in Africa and maybe not anywhere in the world,” she explains. From a start-up entrepreneur four years ago, Kobusingye now directly employs 38 people and sources fish from over 1,000 Ugandan fish farmers. “I am an accidental entrepreneur,” says Kobusingye, who was surprised to receive €15,000 in 2012 as Rabobank Foundation’s ‘Best African Innovator’. Thirty years old at the time, she began sourcing supplies from fish farmers, who in turn had begun to employ innovations to make their own occupation more sustainable. The Masese cooperative fish farm near the source of the Nile on Lake Victoria is one of her suppliers. 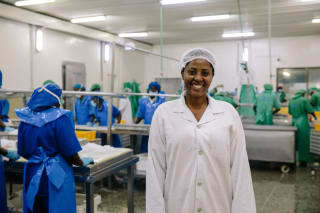 Foreman, Magumisa Magio, oversees 45 farmers and 100 workers. He explains that, “the lake was overfished. 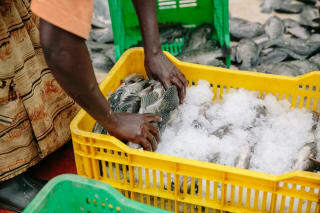 We needed training to reinvent ourselves.” Now they use cultivation cages to farm fish, like tilapia, which are grown to market-specific size (400 - 500 grams) for buyers like Kobusingye. More than two-thirds of Masese cooperative’s members fall in the bracket of ‘youth’ (18 – 35 years old), which is something that Kobusingye keeps a keen eye on as well. “I don’t only look at the quality of my suppliers’ products, I look at who they employ and how. I especially want to support more women and young people,” she says. Over 100 vendors ranging from street stands to national grocery store chains now sell her flagship product. She has also expanded her offerings to include ready-to-cook fillets and immaculately gutted whole fish, flash frozen in a high-standard processing plant. Asked if she has any advice for similarly ambitious young entrepreneurs, Kobusingye says, “Make sure that transactions are formal, support your suppliers, and brand yourself.” She works closely with her numerous suppliers, sets the size and weight objectives they should meet, but also fronts them the money required for the feed. “It is a working relationship, and communication is key,” she asserts.